Deia is an investment banking professional with more than 18 years international business experience in Paris, Geneva and Zurich. She has a demonstrated track record in originating, structuring and executing complex transactions both on debt and equity side within her strong network of relationships with top corporates, business owners, NPOs, MDBs and institutional investors. Throughout her various positions, she has developed an in-depth understanding of debt financing and capital markets on a global basis, with a strong focus on emerging markets and innovative solutions. 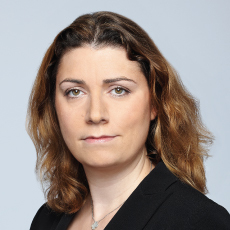 She is currently Director in the recently created Impact Based Finance team of Société Générale Corporate and Investment Banking, whose mission is to identify and implement new financing solutions for the SDGs, using impact-based business models and digitalization to reduce the cost-to-impact while creating long term value for all stakeholders. Deia holds a MSc in Finance from University of Paris and a PhD in International relations and Diplomacy from CEDS Paris.